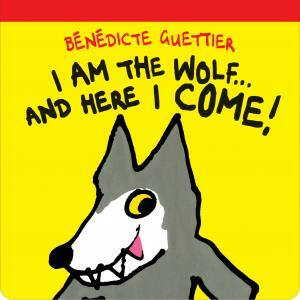 I am the Wolf…and Here I Come! This boardbook has extra-thick board pages and strong cloth binding that will withstand many reads (it will need to!). 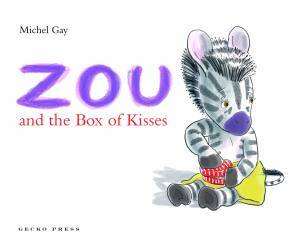 It’s a French bestseller, with bold illustrations and simple text, great for reading aloud, with a fun ending guaranteed to get giggles. It’s also good for discussing getting dressed and different items of clothing. 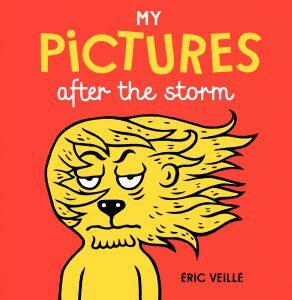 A gust of wind, an elephant, a dive bomb, a spell: this funky “before and after” book will have you chuckling! What happens to a lion after the storm? His mane is swept into a dishevelled mess. What becomes of a pear after an elephant passes by? Pear jam! A frog after a spell? A prince. And the room after a battle? A big mess! Comical illustrations, witty wordplay, and new rhymes and jokes to find with each re-reading. A funny children’s book for ages 2 and up. 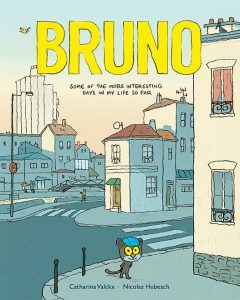 Bruno, the cat in the checkered cap, takes life as it comes. When it’s too rainy to go outside, he rustles up an inside picnic with his friends. When he meets a fish swimming in the air, he follows it. Why not! When the canary forgets how to sing and can only speak gibberish, Bruno helps out. Days come and go, and they always bring something interesting. And once in a while, a day comes along that is just about perfect! These six linked stories by a top children’s writer and renowned comic artist are full of friendship, silliness, and the little moments that make life good. 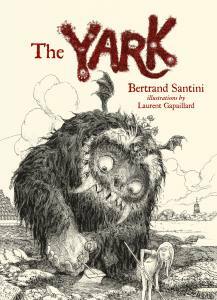 The Yark loves children…with the love of a gourmand! This hairy monster dreams of child buffets—ham of boy, orphan gratin, schoolchild purée, breaded babies, girl rillettes. But he has a problem: his delicate stomach can only tolerate nice children; liars give him heartburn, savages spoil his teeth. There are not enough good, edible children around to keep him from starvation. Then the Yark does find delicious, sweet Madeleine. Will he gobble her up? Or will she survive long enough to change his life? 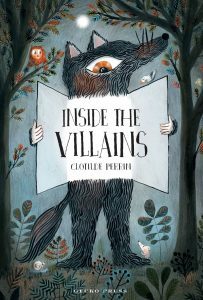 Lift the flaps to see the devilish tricks inside each villain’s head, what’s beneath their disguise, who was the victim of their last meal (now comfortably settled inside their stomach!). Read all about each villain on their personality card, which shows strengths and weaknesses, favourite pastimes, physical characteristics, their best meal and—of course—their favourite books. 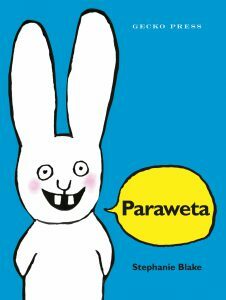 This exquisitely produced book is like no other: a celebration of story that’s full of humour and detail, to mesmerise readers of all ages. 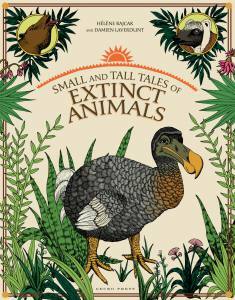 A fascinating journey around the world of extinct animals. It combines cartoons with naturalist drawings, and mythology with science. Hunted by humans and weakened by climate change, these animals gradually disappeared. All that remains are footprints and fossils, explorers’ stories and fascinating folk tales. All waiting to be discovered in the pages of this book. Through legend and mythology, anecdotes and scientific facts, the authors tell fascinating stories of the strange animals that disappeared before our time. The book is a tragicomedy and a mine of information for everyone interested in the animal world. Zou is spending his first night away from home. He knows he will miss all his daily kisses: morning kisses, bedtime kisses, no-reason-at-all kisses. He needn’t worry. Mum and Dad have a solution – one that works surprisingly well on the train. At lunchtime his father would say, ‘Eat your spinach, my little rabbit!’ He’d reply: ‘Poo bum!’ One day, he meets a hungry wolf. Will the little rabbit learn his lesson once and for all?